Ask fellow campers about "McArthur-Burney Falls State Park" and nearby attractions. Stayed one night passing through. No hookups. Walking trails are nice. Hosts seem to keep the place very nice. Will stay again. We camped at McArthur-Burney Falls State Park in a Motorhome. $30.00 is steep for a plain jane no hookup site. That's the tenting rate too. Campground is spacious with lots of tall pines for shade and shelter. Park has a lake and beach with boat rentals and fishing. Burney Falls were spectacular. Sites were level asphalt with fire ring and picnic tables. Numerous community water spigots. Lots of cabins and people who mostly were quiet during quiet time. Firewood was honor system $5.00 per bundle. Didn't use the park store. The visitor center was open (11-3) and had Wi-Fi while open. No cell signal. Drive 10 miles to Burney for cell and Safeway. Flush toilet restrooms with pay showers. Generators OK 9A-8P. The Staff was professional, efficient and friendly. We camped at McArthur-Burney Falls State Park in a Truck Camper. Campground is spacious. We thought it might be noisy as some sites had large families, but they were all very quiet. There is an $8 transaction fee. Park has a lake and beach and we didn't use it but will next time. The falls are spectacular. Our site was level. All sites had picnic table and fire ring. Lots of cabins. The store was nice. The visitor center was open limited hours (11-3) and had Wi-Fi while open. No cell signal. We drove to Burney for Verizon 4G, 10 miles, where we also found Safeway. Trails are limited due to park size but we enjoyed them. We camped at McArthur-Burney Falls State Park in a Travel Trailer. Camp store is nice but we shopped in Burney at Safeway. Nice, well kept park with lots of shade but no hookups. We camped at McArthur-Burney Falls State Park in a Motorhome. Nice wooded campground. Lots of tall trees. We had no trouble with paved interior roads in a 30ft travel trailer, using care. Sites not too unlevel. No sewer, no electricity, water spigots randomly in the area. No Verizon cell signal. Flush toilet restrooms with pay showers. Each site has picnic table and fire ring. Generators OK after 10am. Nice general store. Nice waterfalls, and lake with fishing, boat rentals and swimming. Our friends were in a cabin, hard mattresses, built in bunk beds, no furniture, no electricity or water. We camped at McArthur-Burney Falls State Park in a Travel Trailer. This place was just OK. Lots of trees, so it seemed we were camping in a forest. Kinda cool, kinda not. Spaces were level. Good place to camp to enjoy the lake and falls. No Wi-Fi that I could use, but I guess there was a fee. I heard it did not work well from a neighbor. My phone service did not work here either, so I had to go into town to use my phone. We camped at McArthur-Burney Falls State Park in a Travel Trailer. A great California State Park! Spacious sites and lots of separation between them. Friendly rangers and hosts. Nice hiking to and around the falls. Had heard about this park 4 years ago and now can't understand why I waited so long to go. We camped at McArthur-Burney Falls State Park in a Motorhome. Just love this place. We usually only stay a day because we are passing through. Just a beautiful place. We always stay here. The falls are incredible. We camped at McArthur-Burney Falls State Park in a Motorhome. This was a one night stand running between Tahoe and Oregon via Hwy 89. Beautiful setting. No hookups but that was not a problem for us. The restrooms and showers were clean and modern. Coin operated showers (bring quarters). Good open areas between the campground and the marina for dog walking. Nice camp store. Very nice State Park and enjoyable in the "off season". A little spend y for the amenities. We camped at McArthur-Burney Falls State Park in a Truck Camper. The rate reflects $2 discount for senior citizens. The staff was friendly. There are no hookups, but a dump station is available at no extra cost and you can fill up with water before parking. Sites are back-ins and are somewhat small. We have a 32' 5th wheel and we barely got it in our site. Our back wheels were off the pavement and we had to unhook to keep our tow vehicle out of the roadway (which was inconvenient, as we stayed overnight only). The sites did have a lot of space between them though. There are numerous walking trails, including the Falls Loop which is a must-see to take in the Burney Falls - one of the most beautiful and unique waterfalls we've seen. The park allows dogs, but not on any of the trails, including Falls Loop. They are allowed on the Cemetery Trail, however. Bikes also are not allowed except on paved roads and the Cemetery Trail. The PCT Trail runs through the park and you'll see a lot of through-hikers stop here. The park also has a lake for boating and swimming, a very small Visitor's Center with a really nice video about the park and Falls, and a large camp store. Showers are pay to use ($1 for 5 minutes) and didn't seem all that clean. We camped on a Sunday, and the park was quite packed with lots of day visitors, campers, and families. We understand this is usual during the summer so reservations are highly recommended. We were told that AT&T WiFi was available within 150 feet of the Visitor's Center, but it was a pay-to-use connection we declined to use. There is no WiFi in the camping area at all and we had no Verizon Internet nor phone reception. We would stay there again, though with no hookups we would go in the Spring or Fall for cooler temps (elevation is about 3,000 feet and the summer is very hot - particularly for us as it was during a triple-digit heat-wave). We camped at McArthur-Burney Falls State Park in a Fifth Wheel. There are a dozen or so cabins amidst the 128 camping sites. Parking pad of asphalt and level. Paved interior roads. Each site has container for provisions, a fire ring and picnic table. Sites are back-ins and will not take a rig much larger than 32 feet. All shaded with mature fir trees. Walking trails available and the Falls are a must-see. Supposedly AT&T WiFi available within 150 feet of Visitor Center though most sites will be much further away. We camped at McArthur-Burney Falls State Park in a Motorhome. 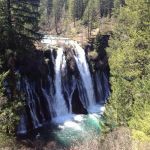 Are you affiliated with McArthur-Burney Falls State Park ?